Often times in our lives, there are things we can’t do or have no control over. We give reasons when we talk with other people. This lesson describes how “because of” is used in Korean. In this dialogue, we’re going to learn how to say “because of…” something. Teacher : Alright, shall we all be seated? Student : Joe is not here yet. Teacher : Is Helen here? Helen : I am here. Teacher : Why were you absent yesterday, Helen? Helen : I couldn’t come because of cold. Teacher : Are you alright now? Helen : Yes, I am much better. Thank you. Joe : I am sorry I am late. I am late because of the traffic. Teacher : Joe, I am glad you are here, but come little earlier next time. 조, 당신이 와서 기뻐요. 하지만 다음 시간엔 조금 일찍 오세요. I didn’t go to the mountains because of the math test. I couldn’t go on a trip because of a cold. 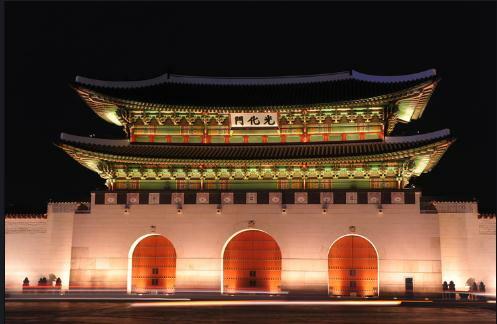 There are several palaces in Seoul because Seoul (Hanyang) was the capital of the Lee Dynasty which is also called Josun. 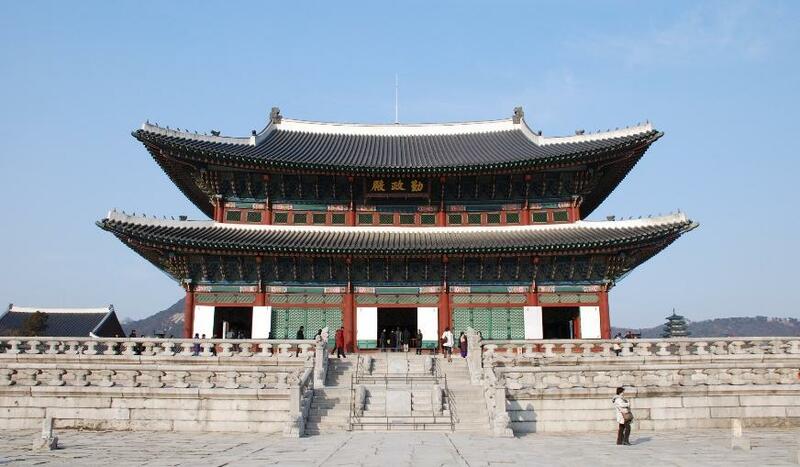 Of all the palaces, Gyungbok Palace is the most important. The kings of Josun lived in the Gyungbok Palace. The Gyungbok Palace was a built in a very good fengshui site. It is about 5.4 million square feet. Originally it was built by the first king of Josun in 1395. In 1592, it was burned because of the war with Japan. In 1865, it was rebuilt. Gyungbok can be literally translated as the “Wish for a great blessing.” Inside of the Gyungbok Palace, there are a number of buildings. 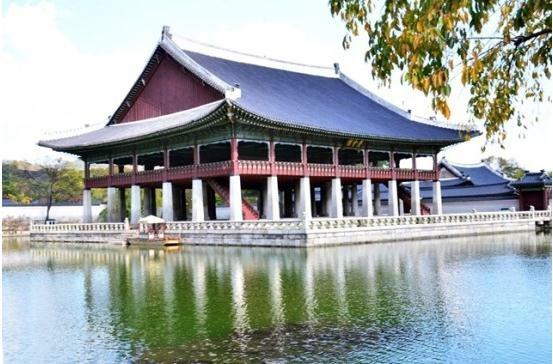 The most important building of the Gyungbok Palace is the Geunjung Jun. This is where the king greeted the foreign ambassador and held official ceremonies. Inside the Geunjung Jun, there is the king’s chair. In front of Geunjung Jun, there are eighteen rectangular stones that are lined up which means the king’s officials based on their rank. Higher rank stood nearer to the king. Behind the Geunjung Jun is the Sajung Jun which is where the king worked. There is also another building called the Gangnyung Jun which is where the king slept. Next to the Gangnyung Jun is the Gyotae Jun. This is where the queen stayed. On the back end of the Gyotae Jun is the queen’s garden. Its name is the Ahmi San. In the garden, there are four hexagonal chimneys that have beautiful illustrations on them. This made them not only functional but also a masterpiece. It is one of Korea’s national treasures. Northwest of the Geunjungjun, there is a pond. In the middle of the pond, they built Gyunghoiloo. This is where the king held a festival. It is a two-story building and probably the biggest pavilion of Josun. There is a palace inside of the Gyungbok Palace. It is called the Gunchung Goong. 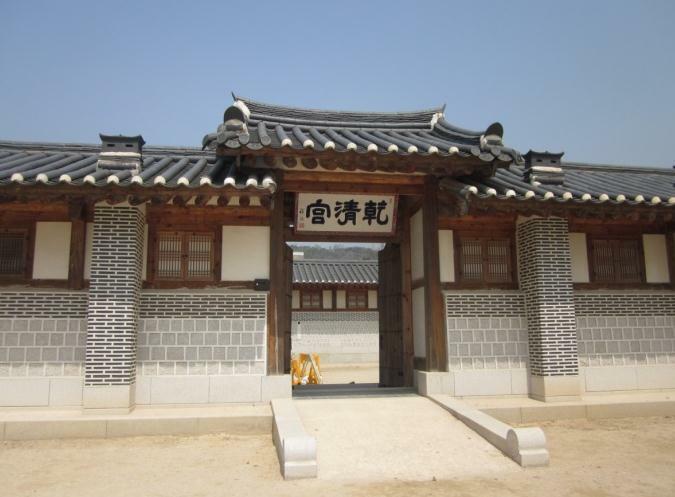 This is the house where King Gojong and Queen Myungsung lived. In the Gunchung Goong, Queen Myungsung was killed by Japan’s ninjas. Structurally, the Gunchung Goong is very similar to an ordinary house of a nobleman in Josun. Today, it is said to be most beautiful Korean traditional house. 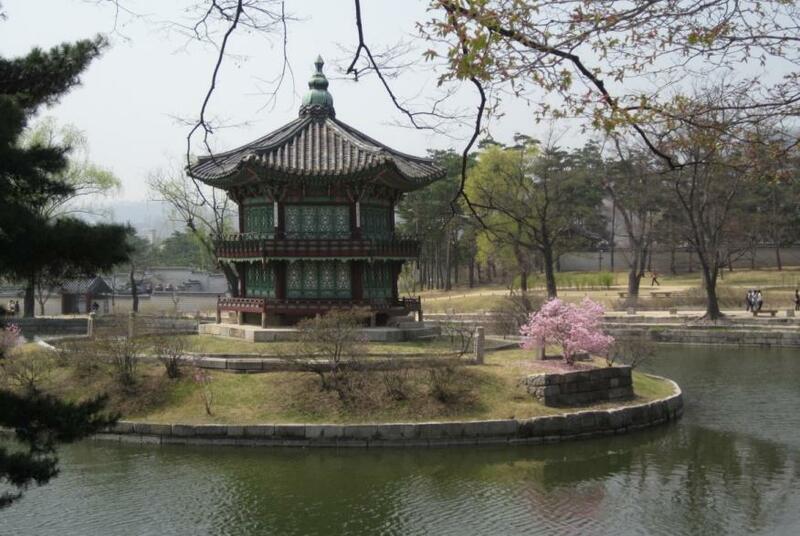 In front of the Gunchung Goong, there is a octagonal pavilion named Hyangwonjung. This place was only for the king and his family. We are going to learn a short conversation for an airline ticket reservation. Kim : This is the travel agency, isn’t it? I would like to book a flight to London. 런던 가는 비행기를 예약하고 싶습니다. Clerk : When will you be leaving? Kim : Is there a plane on Wednesday or Thursday this week? 이번주 수요일이나 목요일에 비행기가 있나요? ( ee bun joo soo yo il ee na mok yo il eh bi haeng gi ga it na yo? Clerk : Please wait a moment. Yes, there is a plane to London on Wednesday . 네, 수요일에 런던행 비행기가 있습니다. Kim : Is it a direct flight? Clerk : No, you have to transfer in Hong Kong. Kim : What is the rate? Clerk : $ 1000.00 one way and $1600.00 for round trip. 편도는 1000불이고 왕복은 1600 불입니다. Kim : Please make a reservation for a round trip ticket. Clerk : Please tell me your name and contact number. Kim : My name is Kim Davis and my cell phone number is 123-4567. 제 이름은 Kim Davis이고 제 셀폰 넘버는 일이삼에 사오육칠입니다. Clerk : All done. Please drop by our office to pick up your ticket tomorrow. 다 됐습니다. 내일 비행기표를 찾으러 저희 사무실에 오십시요. We are going to learn a short conversation at the restaurant. Waiter : Good Evening. How many people? Waiter : Smoking or non-smoking? 흡연석, 금연석 중 어느 것을 원하시나요? Customer : What do you recommend? Waiter : Boogogi and Galbi are very tasty for barbeque. I also like to recommend Bibimbab. Customer : We will try Bibimbab. Could you make it less spicy? 덜 맵게 해 주실 수 있나요? Waiter : Yes. I will bring spicy paste separately. 네, 고추장을 따로 가져 오겠습니다. Waiter : How is everything? Customer : It taste very good.. Could I have more cold water please? ( mae oo mat it seum ni da. naeng soo jom du joo se yo ). Waiter : Sure. Here it is. Waiter : What would you like to have for dessert? Customer : What do you have? Waiter : Ice cream and Tea. Customer We will take Ice cream. What flavor do you have? 아이스크림으로 하겠습니다. 어떤 맛이 있나요? Waiter : We have green tea or vanilla. Customer : Green tea ice cream, please. Waiter : Here is your ice cream. Customer : Can we have a bill? Waiter : Here it is. Thank you. We are going to learn a short conversation in the taxi. Driver : Hello. Where do you want to go? Customer : How long does it take to there? Driver : Usually it takes only thirty minutes. 보통은 삼십 분 정도 걸립니다. But it will take about one hour now because of the traffic. 그렇지만 지금은 교통체증 때문에 약 한 시간 정도 걸리겠네요..
Driver : Here we are. This is Silla Hotel. Driver : Thirty five thousand Won. Customer : Ok Here is Forty thousand won. Diver : Here is your change. Five thousand Won. 거스름돈 오천 원 여기 있습니다. We are going to discuss about a short conversation for a hotel reservation. Information : Hello. May I help you? Customer : I’d like to make a hotel reservation in Seoul. Information : What part of Seoul do you want to stay? Customer : I’d like to stay in downtown in Seoul near Insadong. Information : Is there any price range? Customer : About 200 dollars per night is good for me. Information : How many days do you want to make a reservation for? Customer : Three Nights from today. Information : Seoul Hotel and Namsan Hotel are available. Customer : Which one is in more quiet area? 어느호텔이 좀 더 조용한 지역에 있습니까? Information : Namsan Hotel is a smaller hotel and in the quieter area. Customer : How could I get Namsan Hotel? Information : You can take taxi or airport limousine. We are going to discuss about a short conversation at the market in this lesson. Salesclerk : Hi there. May I help you with anything? Customer : How much is this shirt? Salesclerk : It is 10,000 won. What size do you wear? 만 원입니다. 어떤 사이즈를 입으시나요? Customer : Could I have the largest size you have? Salesclerk : Here you go. Customer : May I try it on? Salesclerk : Sure. The fitting room is over there. Customer : Do you have this in other colors? Customer : I’ll try on both of them. 두개 다 입어 볼께요 . Salesclerk : How are they? Do you like it? Customer : Yes, I like it. I’ll take blue. 네, 마음에 들어요 파랑색을 살께요. (ne, ma eum eh deul uh yo. pa lang saek eul sal gge yo. Salesclerk : OK, follow me. Customer : Could you give me a receipt? Salesclerk : Yes, here it is. Salesclerk : Thank you. Good bye. From one book to four book, Native Numeral System changes from 하나 (ha na) to 한 (han), 둘 (dool) to 두 (doo), 셋 (set) to 세 (se), 넷 (net) to 네 (ne), 스물 (seu mool) to 스무 (seu moo). When we count hour of the time, we use 한시 (han shi), 두시 (doo Shi), 세시 (se shi), 네시 (ne shi), 다섯시 (da sut shi), 여섯시 (yu sut shi)………. When we count people, we count like one person, two person……. There are two numeral systems in Korean: Sino-Numeral System and Native Numeral System. We are going to review Native Numeral System in Lesson 14. Native System can be used for Time of the day (Hour), counting products, etc. There are some changes in the word when you use the Native numeral System. We will discuss that in a later lesson. There are two numeral systems in Korean: Sino-Numeral System and Native Numeral System. We are going to review Sino-Numeral System in Lesson 13. Sino-Numeral System can be used for time of the day (minutes), place of rank, counting money, etc. We will discuss about how to use Sino Numeral System in a later lesson.